I had the most amazing trip to LA a few weeks ago, and had the opportunity to shoot with some new bloggers, as well as one that I shot with previously in Palm Springs - Allison of www.butwhatshouldiwear.com. We had a ton of fun romping around Melrose Ave, and actually ended up finding a lot of the Palm Springs vibes in Los Angeles (not surprising, since we both love succulents). Two locations that we came across that were especially Palm-Springs-y were a shop that was being painted with palm leaves and a cactus garden (both within a 1-block radius!). 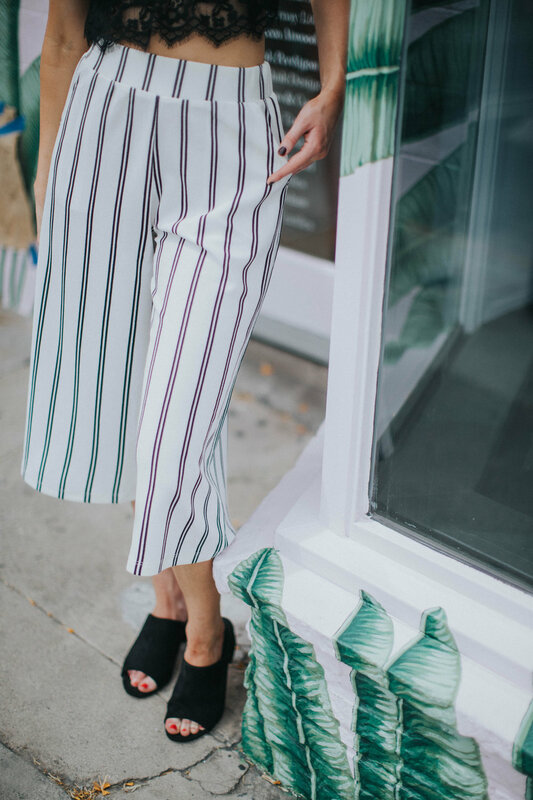 Allison styled the cutest date night outfit for these locations, with a lacy crop-top and gorgeous wide-leg striped pants. Moral of the story - you don't have to go far to find amazing backgrounds. Just keep your eyes open and your styles ready!